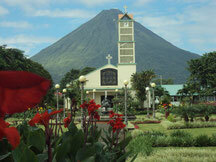 We invite you to check the best deals that you can found at this season at Arenal Volcano Area. Tours and hotels with excellent service and the best rates. Reserve with us for the best Vacation Time in Costa Rica! Arenal Volcano area offers, wildest rapids, the most exciting zip line or canopy tour, horseback riding, Waterfall rappel. caves and other unique challenges for adventure seekers. 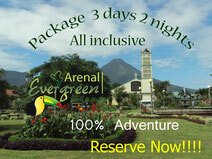 In Arenal Evergreen we put everything in this package just for Adventure people. Visit one of Costa Rica’s most exciting and beautiful locations: The Arenal Volcano! All inclusive package: Arenal Volcano, Tabacon Hot Springs, Safari Float Trip, Arenal Hanging bridges, Fortuna Waterfall, meals, lodging. We invite you to visit this destination, Arenal Volcano, which is considered to be one of the most beautiful regions with the most spectacular hot springs and adventure activities in Costa Rica. Here is an excellent offer with all inclusive: Shuttle service, Lodging, Canopy Tour, Baldi Hot Springs, La Fortuna Waterfall, Arenal Volcano Hike and meals. We Offer you special rate to enjoy Baldi Hot Springs. Reserve through us the Tabacon one day pass and get special rate.